Present in 42 countries around the world, the ICC Marketing Code demonstrates ICC’s role as a global rule-maker and standard-setter. The principles laid out in the ICC Marketing Code are the cornerstone of the national codes of practice enforced by EASA’s network, ensuring responsible advertising in Europe. The ICC Marketing Code provides a 'backbone' encouraging integrity and honesty, helping the industry to stand proud. As a longtime supporter, the IAA applauds 80 years of ICC Marketing Code successes. The ICC Marketing Code can be described as the gold standard for advertising self-regulation. It is used by ICAS members worldwide to develop locally relevant standards. The global standards enshrined in the ICC Marketing Code are a cornerstone of ongoing work to extend the coverage of effective self-regulatory systems. The ICC Marketing Code lays the foundation for the development of responsible and effective advertising self-regulatory systems around the world, making it a primary resource for the advertising industry. In emerging markets, relationships between advertising or marketing practitioners and regulators can be complex. The ICC Marketing Code provides an excellent global reference point for the benefit of all. The ICC Marketing Code is a key component of a necessary ethical framework in which advertisers and their technology can operate - a framework that FEDMA supports with its own Code of Conduct. Applying the ICC Marketing Code’s high standards of ethics is paramount to ensuring that online advertising continues to bring value to European consumers, the industry, and the overall economy. The ICC Marketing Code has inspired self-regulatory structures around the world. Ensuring advertising is honest and decent, these systems build consumer trust and provide quick redress when transgressions occur. Highlighting social responsibility and transparency, the code is a useful tool for advertisers to maintain high ethical standards which enable consumers to trust marketing in all kinds of media worldwide. What is the ICC Marketing Code? The ICC Marketing Code seeks to protect consumers by clearly setting out the ‘dos and don’ts’ for responsible marketing to ensure legal, honest, decent and truthful communications and practices. The Marketing Code sets high standards for a full range of marketing activities, including digital marketing communications with measures to protect children and consumer privacy. To help marketers, advertisers, regulators or any other actors better understand the ICC Marketing Code, the ICC Academy offers a free online course on ethical marketing. An updated implementation guide is also enclosed in an annex of the ICC Marketing Code to help various stakeholders in the marketing and advertising ecosystem put the framework into practice. The ICC Marketing Code covers all forms of advertising and marketing communications, including digital advertising and social media. It is technology and media neutral. It applies to the entire marketing eco-system, guiding communications practitioners, advertising agencies, publishers, media owners, contractors and other participants including market influencers, bloggers, vloggers, affiliate networks, data analytics and ad tech companies as well as those responsible for preparing algorithms and the use of artificial intelligence for marketing communications purposes. All marketing communication should be legal, decent, honest and truthful. Marketing communications should not offend standards of decency currently prevailing in the country and culture concerned. They should not abuse consumers’ trust or exploit their lack of experience or knowledge. Marketing communications should respect human dignity and not incite or condone any form of discrimination or anti-social behaviour. Marketing communications should not mislead the consumer with respect to the product. All forms of claims relating to verifiable facts should be capable of substantiation at the time of publication. Marketing communications should be clearly distinguishable and when appearing in a medium containing news or editorial matter, where appropriate, labelled as such. They should not misrepresent their true commercial purpose. The identity of the marketer should be apparent. Marketing communications should not denigrate or ridicule competitors or their products, other firms, organisations or persons. Marketing communications should not make unjustifiable use of the name, logo or trademark of another firm or institution, and should not take undue advantage of the goodwill belonging to others. Special care should be taken in marketing communications directed to or featuring children or teens. They should not undermine positive social behaviour, lifestyle and attitudes. When collecting personal data from individuals, care should be taken to respect and protect their privacy by complying with relevant rules and regulations. Whatever the nature of the activity, medium or technology, responsibility is shared by all parties concerned, commensurate with their respective role in the process and within the limits of their respective functions. The ICC Marketing Code functions within the framework of local, national or regional legislation, supplementing regulation in a complementary manner. 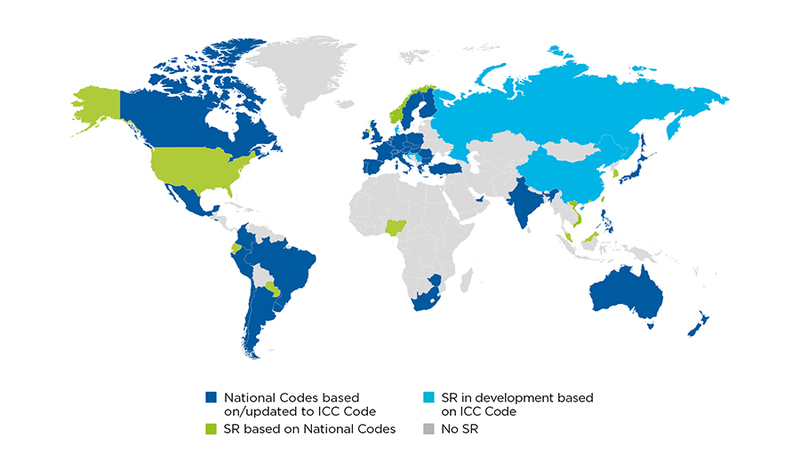 The below map shows where self-regulation frameworks are either based on the ICC Marketing Code, national codes or remain non-existent. The value and effectiveness of marketing and advertising depend on consumer trust. Self-regulation protects consumers and provides a cost-effective, accessible and responsive alternative to other legal avenues. Setting and enforcing best practices for industry gives consumers clarity on standards and recourse while freeing up scarce government resources to focus on rogue traders and other fraudulent practices. Self-regulation also allows greater flexibility than regulation, permitting rapid and measured adjustments to changing technologies and other new market factors. Who’s behind the ICC Marketing Code? ICC’s Commission on Marketing and Advertising brings together the world’s top experts on regulation, self-regulation and ethical best practices in marketing communications. This group, spanning companies of all sizes and sectors from every region of the world—in consultation with ICC’s national committees and industry associations—identifies marketing issues and concerns in consumer protection and develops the content of the ICC Marketing Code to address them. Are you an expert interested in joining our working group? Contact ICC’s Commission on Marketing and Advertising to see how you can get involved. Want more information on the ICC Marketing Code or self-regulation systems in a specific country? Send us an email and we’ll be in touch! 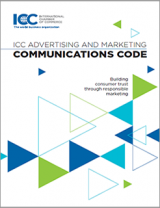 Download "ICC’s Advertising and Marketing Communications Code"
Requests to reproduce the Code or to order print copies of the Code should be made to the ICC Secretariat or for local language translations to the relevant ICC national committee. Shipping and printing costs will be charged for hardcopy orders.